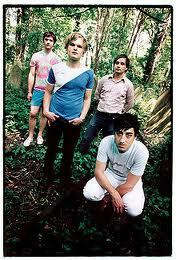 Grizzly Bear is a relatively new band that came onto the scene out of Brooklyn only a few short years ago. While many of you will recognize them for their song Two Weeks, which featured in a Volkswagen commercial during the 2010 Super Bowl, much of the Veckatimest album is good, and it's definitely worth a listen from start to finish. My favorite Grizzly Bear song, Ready, Able, is from that album. While you may lump this band in with the whole hipster/retro/doowop-sounding-harmonies scene that surfaced in recent years, I feel like Ready, Able is a good example of what sets them apart. They have a very unique sound and, I swear, Edward Droste's softly crooning voice combined with magical background vocals and a very smooth guitar is enough to lull me into the sweetest of dreams. Grizzly Bear is known for pretty bizarre videos, and this one must take the cake. I don't know what it means or how it fits with the song. I know it's pretty mindblowing. I feel like it was designed for someone on acid (definitely not me!) but it's enjoyable regardless. And those little green men/monsters that form in the video...well...I have to note that they have very noticeable green penises. When the size of said green men is taken into consideration, they are by no means "little" green penises, either. Just thought that would be fun to note. If nothing else, that should lure you into watching! I was excited to learn recently that Grizzly Bear is releasing a new album this September. They've also assured fans that they will find some way to fit Florida into their upcoming tour. For that, I cannot wait. Love the song! Looking forward to the new album, they've been away too long.